We recently discovered Tom’s Trust when we were asked to help support a wellness event. When we found out about the charity and the valuable work that they do we knew we wanted to help. Sadly brain tumours are the biggest cancer killer of children under 15, and sadly not all children are able to access the psychological support necessary to help them recover. Tom’s Trust is dedicated to providing clinical psychology support for children with brain tumours within complete rehabilitation services. 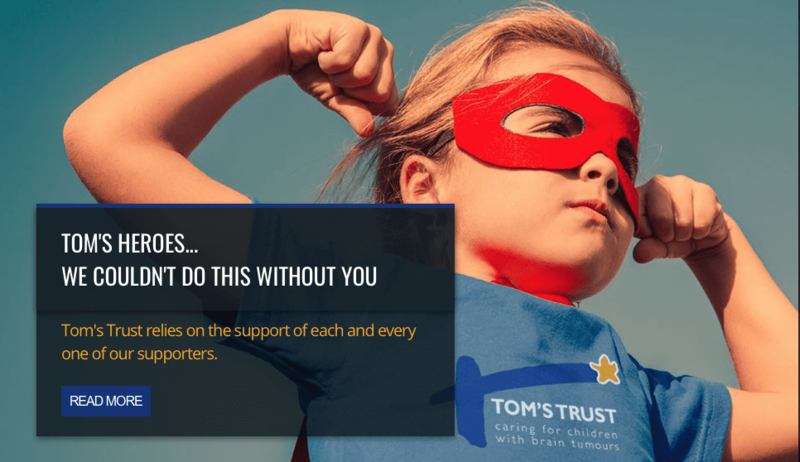 Tom’s Trust say their work will not stop until every UK hospital treating children with brain tumours can offer this vital support to every child who needs it. We love the work that Tom’s Trust do – which is why we have chosen to support them this year! And it’s really easy for you to help us help them! Online charity fundraising and donations made easy. Virgin Money Giving is not-for-profit and is committed to making more money for the charities they support. Just Giving was the worlds first online fundraising business, making donations simpler and safer for everyone. Since its inception in 2001 Just Giving has raised over £1bn for thousands of charities around the world. To donate either £1, £2, £3, £4, £5 or £10 by text, simply send the message”TOMS11£amount” to 70070 e.g. for a £10 donation text “TOMS11£10” to 70070. You can also support by hosting an event or doing a sponsored challenge!